Don’t lime a lawn with a pitch perfect pH! So don’t mess up a good thing! Work, work and more work, Jeremy. 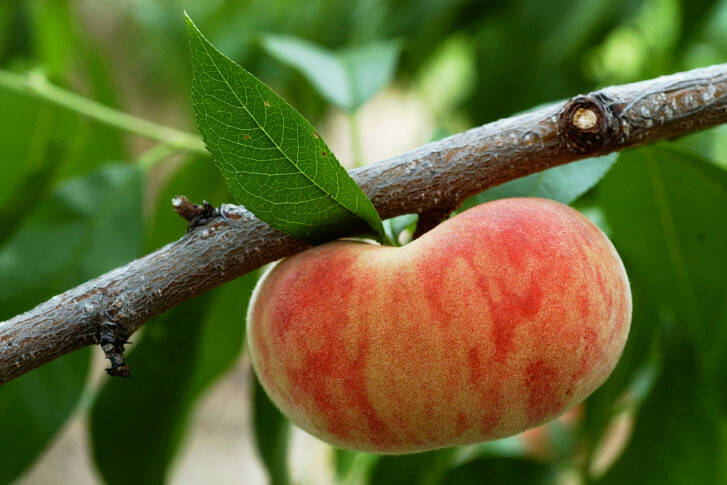 Peach trees must be pruned for airflow every year in the late winter/early spring. Then at least half of the developing fruits must be removed while they’re the size of a marble to ensure that the remaining fruits can reach full size. And yes, peaches must also be “sprayed” — but not randomly, and not with poisons. The best way to protect developing peaches is with a micronized clay spray like Surround. It’ll keep your “worms” (actually small pest caterpillars) away and keep disease at bay. Fresh peaches are pure pleasure, but they require a lot of work. Milorganite is a highly controversial product, Charles; it’s essentially dried human waste from the sewers of Milwaukee. Because it is only dried and not composted; and because people pour all kinds of nasty things into the sewers, Milorganite is not approved for use in organic food production. And because it contains phosphorus (the NPK numbers on the label are 5-2-0), it is not legal for use on lawns in Maryland or Virginia, where new laws designed to protect the Chesapeake Bay prohibit the use of fertilizers containing phosphorus. Use a home grown yard-waste compost like Maryland’s own Leafgro instead. “No” to your second question, Clemencia. After using the same beds for my own garlic year after year I started to get a little neck rot — and the garlic didn’t look too good either. (Ba-dump!) So now I plant my cloves in a different bed at the end of each season, and I don’t return to a bed until it’s been garlic-free for three years. The answer to your first question is “yes!” If you continually select the best cloves from your summer harvest and plant them in the fall, you’ll eventually develop a unique strain that thrives in your specific conditions. After ten years or so, you can even give it a name, like Potomac Purple! And a reminder: Prime garlic planting time is right now! • Do you need to seed a new cool-season lawn of bluegrass or fescue — or overseed an existing one? Time’s a wasting! Right now, the soil is still warm enough for fast germination, and winter is far enough away that the new grass should be strong and well-rooted before any serious cold weather arrives. • Whatever you do, don’t wait for spring — cool season grass seed sown in the spring always does poorly. • We’re in the middle of the perfect window for planting garlic cloves, pansies and new trees and shrubs — and to sow the seeds of lettuce, spinach and other salad greens, which always taste best when grown in the cool air of fall. • But do not plant any spring bulbs yet — it’s still much too early in the season to put new daffodils, tulips and such in the ground. Keep the bulbs in a cool dry spot and plant them after Halloween.